You will earn 8,414 Reward Points. Earn 1 reward point for every 1 dollar spent. Our Rivage Collection delivers the high end look of hand-crafted artisan-ship and architectural detail. The simple front panel exterior on the Rivage I lends itself to a transitional look and feel. Rivage II has a decorative square inset, showcasing attractive hand carved woodwork. Our traditional Rivage III offers a paneled exterior design that’s as classy as they come! Our models are handcrafted in the USA. Geneva’s portable bars offer design flexibility; you can add options for the interior and exterior to tailor your establishment. We offer excellent lead times. 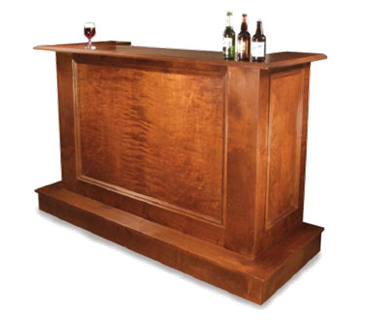 We are the only ones that offer the option that converts the bar to furniture with a convertible double speed rail.